Whitehall Media are looking for 2 new telesales executives! We are one of the UK’s leading conference organisers of IT Related conference for both the private and public sectors, and we have a portfolio of over 15 conferences which we run each year in the UK, Europe, and the UAE. 2 exciting opportunities for sponsorship telesales executives have arisen to join our Manchester City Centre sponsorship sales team. We are looking for ambitious, intrinsically motivated telesales professionals preferably with a B2B background. We provide full training and a fantastic opportunity for you to earn a high 5 figure income within your first year, and a realistic 6 figure income in year 2. To have a good overall understanding and knowledge of Whitehall Media, Our conferences and Sponsorship Packages. Proactively identify potential sponsors for our events and establish a working relationship with them. Responsible for generating 4 decisions a day minimum to build up your sales pipeline. Generating new business leads and progressing them through from initial contact through to selling them a sponsorship package that meets their needs at one of our conferences. Have experience in telesales or sales ideally from a b2b background. Intrinsically motivated with a tenacious resolve to be successful. Be educated to degree level (desired not essential). A good closer – Not afraid to ask for the business! The core hours are 35 hours per week- Monday to Friday from 9 – 5 (with an hour for lunch) in our prestigious Manchester city centre office. 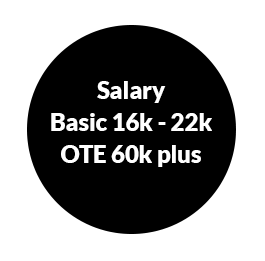 £16,000 – £22,000 + High Commission + Bonuses (Realistic OTE £60,000+ year 1, £120,000+ year two) + benefits 28 days holiday (Including bank holidays). You will also enjoy the opportunity to travel to our UK, European and UAE conferences, all expenses paid. If you have a burning desire to succeed and make money and want to start an exciting new career then we want to speak with you! please apply now with your CV.